Many people don't think to make dessert in their crockpots, but it's such a great way to have a fun sweet treat without having to do tons of work. This chocolate frito candy is a family favorite, and it's a fantastic mix of sweet and salty -- it's sure to satisfy and and all cravings! Originally written in 2008, during my year of slow cooking. We went on a road trip over the weekend, and road trips mean Fritos. When we were first diagnosed with celiac, we were pleased to discover that good ol' Fritos were gluten free. It's so nice to know that they are THERE---at every gas station, and in every vending machine. When we returned home, I still had half a bag left, and they were awfully squished after being in the backseat for 2 days. The best thing to do with crushed Fritos? Make candy! I don't really have a reason. Except for that they are AMAZING. Put the Fritos and the pretzels in a large Ziploc and smash until crumby. Line a 9 x 13 or so cookie sheet with nonstick foil or parchment paper. Set that aside, too. Stir in the Fritos and Pretzels until evenly coated. Using oven mits (use them! The crock is hot!) dump the hot candy out onto your lined cookie sheet and spread out with a wooden spoon. Sprinkle the peanut pieces on top. What I love about melting chocolate in the crockpot is that it melts super slowly -- you still have to sort of keep an eye on it, but you have SO MUCH MORE WIGGLE room before it scorches the way it does on the stove. also, since the heat is so slow and even, there is no need to fuss around with a double-boiler or anything crazy like that. never miss a recipe! Sign up to receive the newsletter(s) directly in your inbox!! #booyah! OMG! I WILL make these today! I have everything in the house. Just wanted to say, I LOVE your blog. You are my absolute favorite to check every day. You always make me smile. I'm allergic to chocolate, but I bet these would be fantastic with white chips! Mmmmmmmm, can't wait to try these! I am a faithful bog-checker of yours, and have started my own blog. May I have your permission to link you in my blog? Check me out sometime. Wow, those look good! Definitely going to have to try that sometime. I love "junk food" snacks! Wow. Who woulda thought? If I try it I'll be sure to put a cardiologist on speed dial first! Oh my gosh! 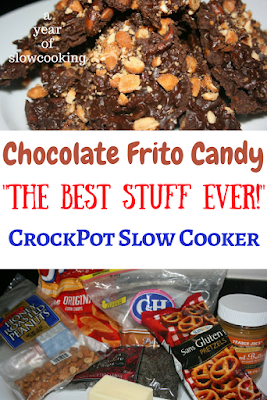 I had no idea one could make Frito candy in the crockpot. Amazing! Thanks for testing. I'm going to have to try this myself. I looked back on Allrecipes where I thought I had gotten it from, and sure enough, there it was. In a greased 10 x 15 inch pan, place the corn chips. In a saucepan, bring the sugar and corn syrup to a boil over medium heat. Remove from heat and stir in the peanut butter until smooth. Pour this over the chip and smooth level. Pour this over the chip and smooth level. Place the chocolate bars in a single layer over the hot mixture and wait a few minutes until the heat melts them and then smooth the chocolate out to form a thin layer. Allow to cool and then break into pieces. It's pretty scary, but I could see these being really, really good. Thanks for posting it. Again, you are so creative...even if it wasn't your recipe, it's what you pick to post! Looks like a great snack! Can't go wrong mixing salty with sweet. I will have to give these a try. This is just mean! I am gonna need to have these I think! this is hilarious and my toddler shall ADORE IT! I thought this one sounded gross bu ti love that you give your verdicts. I wanted to see if it was really "hide in the corner of the garage" good. OH MY - I don't even like corn chips and this was by far one of the best desserts I have ever made. I am planning on doing this one for Christmas gifts! I did not use the crock but combines recipes. I used the 2 cups corn chips 2 cups pretzels. Boiled the brown sugar and butter and 1 tbl peanut butter for one minute. I mixed those together, spread them out and dumped on the chips evenly - melted those and that was it---stuck it in the freezer---TOO easy! bwhahahha, petunia! I'm so glad that you liked this---we sure did, too! I'm with Petunia, I thought these would be gross 'cause I don't like corn chips but I knew my daughter would love them and ummmm? Guess who ate almost the whole pan? Just to clarify, when you melt chocolate in the CP you DON'T put the lid on right? Thanks again, Casandra in Clevelan. Hi Casandra, I'm so glad that you liked these! I can't wait to make them again. I do put the lid on. But if it worked for you without the lid, and you feel more comfortable doing it that way, go for it! I'm lazy and the crockpot is in "deep storage", do you think it would work if I melted the stuff in the microwave? Need to bring a dessert to a pot luck and they don't want anything fancy... this sounds like it would fit the bill perfectly! This looks amazing. Did you use unsalted butter, or regular butter? I noticed Anna's version calls for unsalted. I was just telling my husband about this new recipe. In my excitement, I was speaking rather quickly. When I saw the perplexed look on his face, I realized that he heard "chocolate-free toe candy." Yep, that would explain why he was, um, a bit lacking in enthusiasm. I cleared up the confusion, and now I'm going to add the ingredients to my grocery list. We will be making it with soy butter due to my daughter's peanut allergy. I'll try to remember to post a follow-up on how it turns out! Just following up - we made these with soy butter yesterday, and the texture and consistency were just as I would have expected with peanut butter. This was my first attempt as substituting soy butter for peanut butter in a recipe, and it was a success! On a lark, my friends and I thought we'd try the weirdest sounding crockpot recipe we could. This fit the bill, so we made up a batch one evening. We figured it was either going to turn out great or be a total disaster that we could laugh about for years. A win-win situation either way. Despite our doubts, it turned out really well. Reminded us of a type of candy we have up here in Canada called clodhoppers. We snacked on it all evening and we all (willingly) took some home. 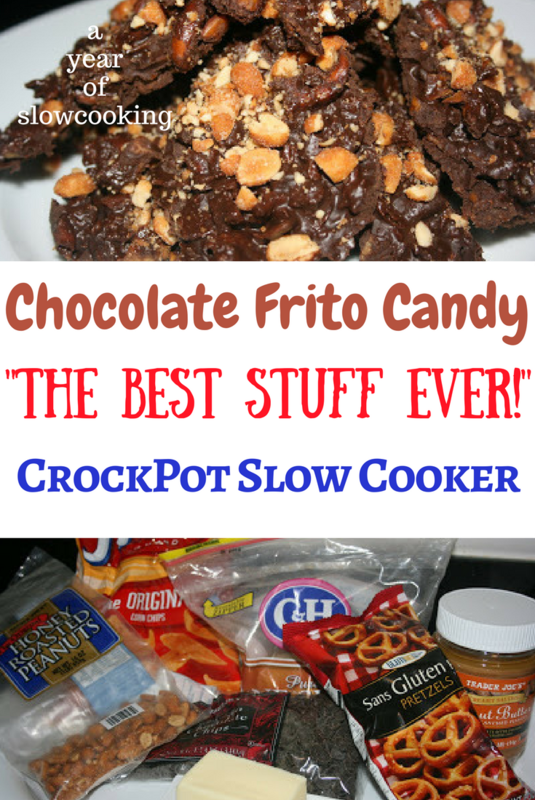 Crazy that fritos would taste good with chocolate. I'll definitely have to try this. Do you think a candy recipe like this would work with margarine instead of butter? I know that oils and fats behave differently, but I can't digest dairy. . . and this sounds SO GOOD! Deborah, I'd give it a go! My mom always uses Nucoa (sp?) for baking. Can you imagine having to be soy free, dairy free and peanut free around the holidays? Yes, I'm about to go stark raving mad! I think I can fashion this into a safe treat for me. I have safe chocolate chips and sunbutter. We'll leave out the peanuts, but I'm at a loss on what to use instead of all that butter? I have spectrum palm oil shortening? Managed to make this made dairy, soy and peanut free and it's still AMAZING. The salty, the sweet...it may very well be the cure for PMS! Hey there, Stephanie! This is yet another really cool recipe! I am officially in love with your blog. Thanks for sharing!